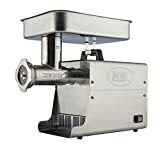 LEM Products Meat Grinder Accessory Kit, Garden, Lawn, Maintenance , selling for $157.39 brand new. Manufactured by Garden-Outdoor. There are 2 units left brand new. LEM Products 819 Meat Grinder Accessory Kit comes with everything you will need to get the most efficient use out of your electric grinder. 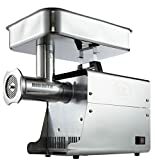 This kit contains the Ground Meat Packaging System (bag taping machine, 1 roll poly bag tape and fifty 1 pound wild game bags) the Grinder Foot Switch (that allows you to start and stop the machine with a tap of your foot, while keeping your hands free for stuffing casings or filling ground meat bags) and the Grinder Cleaning Kit (2 1/2″ diameter brush for cleaning the head, five small brushes for cleaning grinding plates and stuffing tubes, and an 11 ounce can of food grade silicone spray to lubricate and prevent rust). This complete meat grinder accessory kit will help you keep your grinder running and looking like new.